Crone Webster Furr was the founder of the Furr Food Store chain, a familiar group of stores in West Texas and Eastern New Mexico. Furr was born May 8, 1878 in North Carolina into a family that included five brothers and four sisters. In 1894, when he was still a teenager, his family moved to Collin County, Texas. Two years later, he married Annie Furr, whose family was unrelated but bore the same last name, and shortly thereafter he began farming a rented farm a few miles out of McKinney, Texas. Furr was industrious and opened a small grocery store at a crossroads near his farm. For a while he farmed by day while a cousin ran the store. Furr’s interest in the grocery business continued to grow, and he sold his store and in 1904 moved to Kirland in Childress County where he established a grocery business called Kirkland Mercantile Company. A few years later, in 1908, in the same location as his store, he set up the First State Bank of Kirkland with $10,000 of his own capital. His original building suffered a fire in 1915, but he was able to rebuild and replace it with three larger brick structures, one housing the grocery store, another housing the bank and the third containing a dry goods business. Over the next few years, his grocery business expanded to the north Texas towns of Claude, Iowa Park and Hadley with each store being managed by one of his brothers. In 1924, he bought an M System franchise for Amarillo. The interior of each M System store was laid out like the letter M. In 1927 he sold his Kirkland businesses and opened two more M System stores in the Panhandle towns of Borger and Phillips. The success of these businesses allowed him to acquire the better known Piggly Wiggly franchise in Amarillo. His two franchises were able to weather the depression. 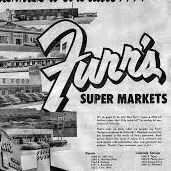 They operated and expanded until 1934 when the Amarillo locations were rebranded as Furr Food Stores. Crone was joined by his sons, Roy and Key Furr, who respectively worked in the business or went to work for a company later acquired by Furr. As of 1931, the Amarillo chain had eleven stores in town and fourteen more in surrounding towns in the Panhandle. When Crone died in 1946, the footprint of the business stretched from Denver, Colorado to El Paso and Odessa, Texas on to Eastern New Mexico. It was somewhat vertically integrated, also included packing plants in West Texas, a creamery, bakery, food warehouse and its own delivery trucks, mostly headquartered in Lubbock. The Furr’s Cafeteria chain began in the year of his death with the opening of the first location in Hobbs, New Mexico. Both the supermarkets and cafeteria businesses continued for several decades under the leadership of Roy Furr who died in 1975, but since have been sold to other investors. Crone W. Furr was known for his devotion to his business, but was also deeply involved in his church, the Polk Street Methodist Church in Amarillo where he regularly worshipped and sang in the choir as long as he was able. He is known to have only joined one social club, the Lion’s Club and contributed generously to Clarendon College and Abilene’s McMurry College.